Linux Mint 6: From freedom came elegance..
Ubuntu has proven to be such a popular distribution that there are even other distributions based off of it nowadays ;). One such distro I found amazing was the Linux Mint which seeks to take the ease-of-use provided by Ubuntu to a new level and, for the most part, succeeds. That even there own Linux Mint’s slogan is “From freedom came elegance” and that’s very appropriate for what this distribution is all about.. The universal edition does not include any proprietary software, support for restricted formats, or patented technologies. It’s geared for people in countries that might otherwise forbid some or all of these things. Installing Linux Mint is easy. If you’ve ever installed Ubuntu or even Windows then you shouldn’t have a problem installing Linux Mint. When you insert the CD and reboot you’ll default to a Live CD that lets you run Linux Mint without having to install it. The Live CD thing is very nice for those on the fence who aren’t sure whether they want to jump into doing a full install. Actual you will find no problem with the Install..
Linux Mint uses Gnome as its desktop environment so you’ll feel right at home if you’re a Gnome user. KDE fans might not appreciate it as much but will acclimate to it soon enough. After logging onto your Linux Mint desktop you’ll note that there is the usual “Start” type button but it’s labeled “Menu” and it will take you to the usual menu lists to access your applications, preferences, etc. Linux Mint’s menu system is nicely done as it lets you access all your app categories, system management tools, and important places on your system (home, trash, etc.). You won’t have to spend a lot of time clicking around to find where things are even if you’re totally new to Linux Mint. You can customize your desktop a bit by clicking “Menu”, then “Preferences”, then “mintDesktop” to start the LM desktop configuration tool. Note that there are arrows that let you scroll left or right to see various options that you can change. Frankly I would rather have had a different system for this as newbies might not notice that they can scroll. A set of icons or something closer to how Apple does it in their System Preferences tool would be better. There’s definitely some good additional software available and it’s very easy to install onto your Linux Mint system. After you settle in, be sure to spend a few minutes browsing around and picking out some extra software for your system. One of the things that sets Linux Mint apart from Ubuntu and some other distributions is that it is more multimedia-capable “right out of the box.” I tested this by playing a DVD on my LinuxMint-installed system and by trying some YouTube videos. I was somewhat disappointed to note that the DVD did not auto-load like it does in Mac OS X. I’m not sure whether that was because I was running Linux Mint in VMWare or not. Anyway, to run the DVD I fired up the Totem movie player and clicked the Movie menu, then clicked on “Play Disc All American Hunts.” The DVD played fine, the video was good and I had perfect sound with no need on my part to download any additional codecs. Quite a change from the reputation some Linux distributions have. the mintDesktop tool is potentially confusing to newbies to Linux Mint. The way it’s set up is not particularly intuitive and could potential make a newbie think that you can only configure Desktop Items and Nautilus Mode, which isn’t true. mintDesktop needs to be tweaked a tad bit and I’d like to see an icon dropped on the desktop by default for it since it’s a handy tool that should have a more prominent place on the LM desktop. 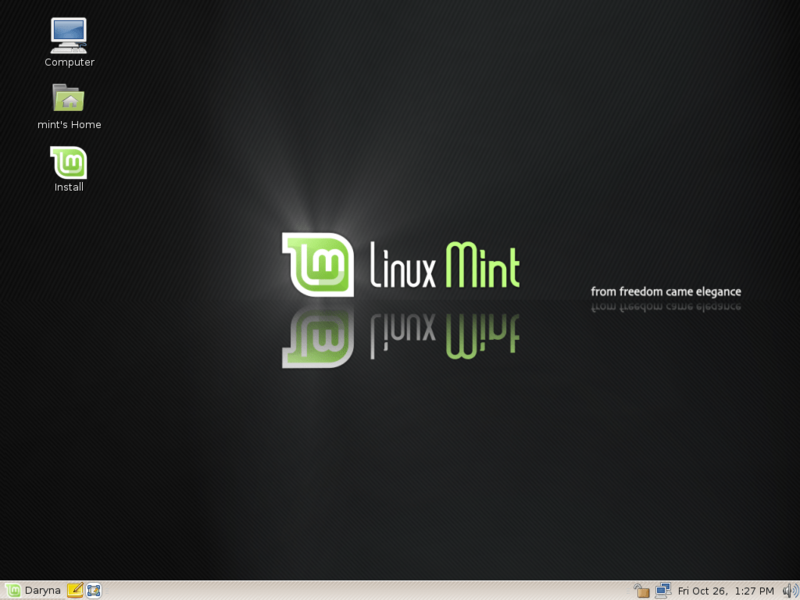 I like Linux Mint a lot. In some ways it’s what I wish Ubuntu itself had been. If I had to choose between the two of them, I would pick Linux Mint because it’s Ubuntu but better. While I noted a few things that could be improved, Linux Mint is definitely worth a download. I really like the look and feel of Linux Mint. The artwork and the overall aesthetics of this distribution are very easy on the eyes. In an odd way it reminds me of Mac OS X without all the overbearing Apple glitter or the Apple tax. It’s slick. And don’t just run it in Live CD mode either. Give it an install on your system. If I were in the market for an alternative to Windows, Linux Mint would definitely be at the top of my list. I still hear some people say “Linux still isn’t ready for the desktop” and stuff like that sometimes. Pros: Includes bundled multimedia codecs. Slick, Gnome based desktop with well designed menus..
Cons: mintDesktop config tool could use some tweaking and multiple ways to manage software could confuse some users who are new to Linux. Summary: Linux Mint is an excellent choice for anyone looking for a viable alternative to Windows or Mac OS X.